Guiding Principals: Saving Trees, Improving Lives! Community & People First! To see our daily updates & to interact with us, please click to follow us on Facebook and Instagram and please share! We also offer a Monthly Newsletter with special insights into our business and our tree re-use & donation efforts including access to subscriber ONLY special promotions & coupons. You asked, we listened! 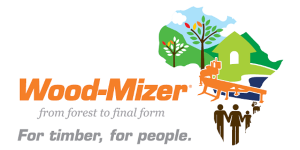 We will continue to challenge the sawmill industry here in Texas and help to bring more positive change! A high quality sawmill that genuinely believes active environmental & community support is the primary key to long-term business success. Simply said, we want to be your neighborhood & community sawmill and grow our business to better all of Texas. 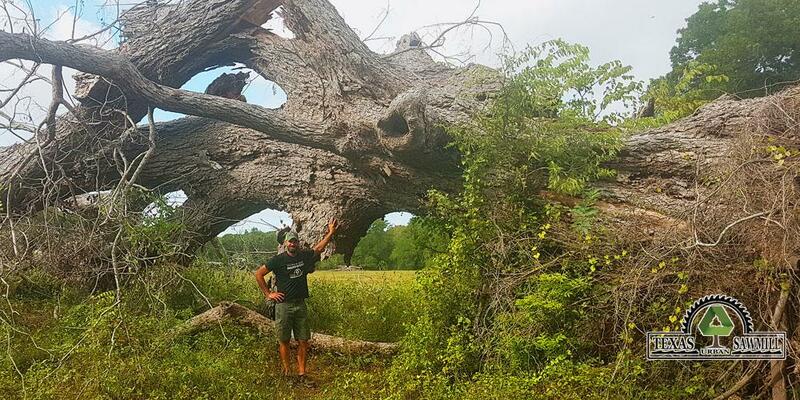 We are proud to be saving the largest documented (salvaged) pecan in Texas. Older than the Declaration of Independence. Devin is 6’4″ tall & looks short! 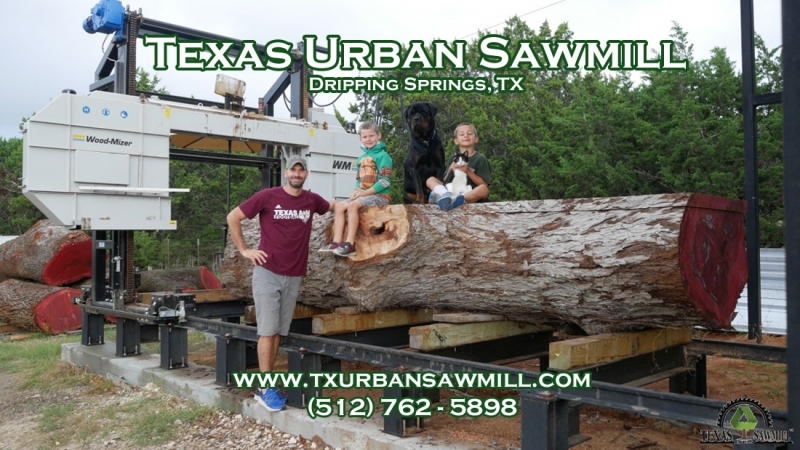 The Texas Urban Sawmill is a family-owned business. Your business supports four heavy invested families with a total of 9 kids from the ages of 2 up to 14 years old (Thank You!). We are dedicated to tree re-use advocacy, turnkey tree salvage & re-purposing solutions, production of high quality urban lumber & live edge slabs, and being stewards to our local communities & environment. Freshly milled red oak log that is being re-purposed into ceiling cladding for a Dallas Presbyterian Church. We are proud to operate the largest cut capacity sawmill in the southern US. We are THE only business in Texas focused on offering turnkey tree salvaging & re-purposing (re-use) services. We mill for both the general public & other like-minded businesses at the most competitive rates. For logs over 36″, we offer a price guarantee & will beat any equivalent bid. We welcome visitors & have monthly public log cutting viewing opportunities. Jeanette, Devin & Brent enjoying a hard day of work together! We consider it our primary mission to help educate local businesses & residents on the benefits of urban forestry re-use, so we can build a grass-roots, forestry re-use initiative for many others to adopt across Texas. How do we accomplish this? We feel progress is less about talk & more about action. This philosophy is supported by our large 2017 investments in the equipment to make this a reality in Texas. We are actively seeking architectural firms, engineering construction firms & residential builders who would like to be involved in re-use projects. 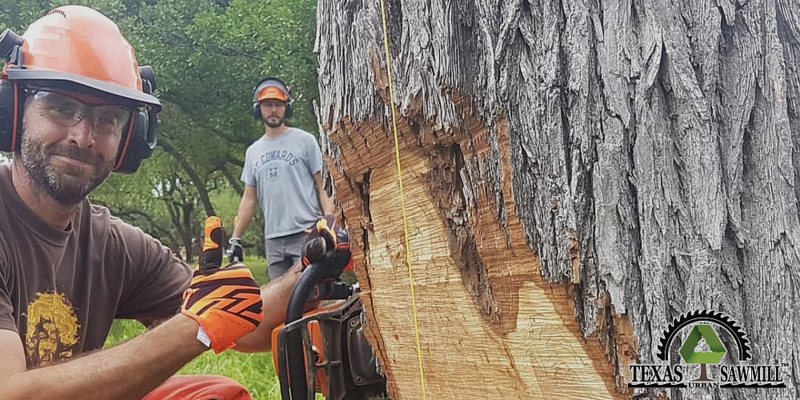 We also work with land owners & home owners to assist in salvaging large trunks and limbs free of charge (30″ or larger trunks). There are literally 100’s of millions of trees across Texas that continue to go to waste, while they can be salvaged, re-purposed and turned into valuable re-use materials for all to enjoy. Additionally, these heritage trees have historical significance and most end up in landfills, as mulch or burnt. If you want to learn more, please see our Re-Use Story page. 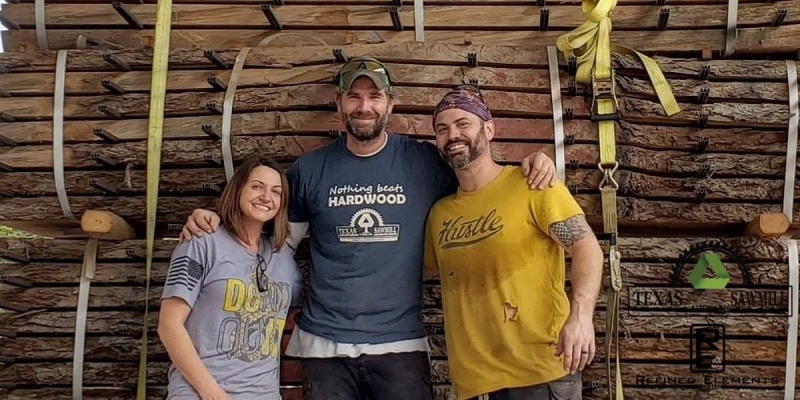 We are proud to announce that the Texas Urban Sawmill, along with our sister company, Refined Elements, is a corporate sponsor of Habitat for Humanity. As we receive tree donations to support our efforts, we believe strongly in paying it forward. We’ve made it our promise to Texas to donate a portion of our lumber proceeds on a regular basis to the HfH and other non-profits to help support those less fortunate & ultimately to help improve lives. Scott has just dropped off a series of red oak slabs to the Austin Habitat ReStore. 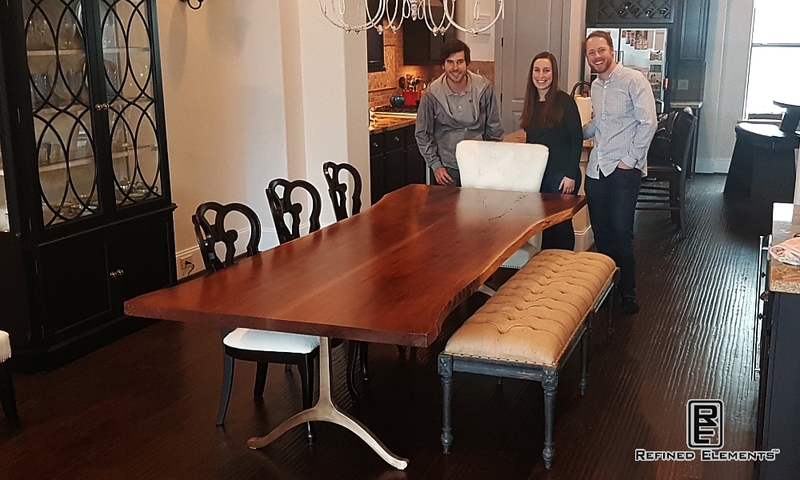 Finally, you can also see some of our spectacular live edge and urban wood furniture at our Refined Elements LLC webpage & our latest works & updates on our Facebook or Instagram pages. This is the business we started in 2012 that remains focused on building custom, hand-crafted, urban wood furniture. We specialize in dining tables and conference tables. 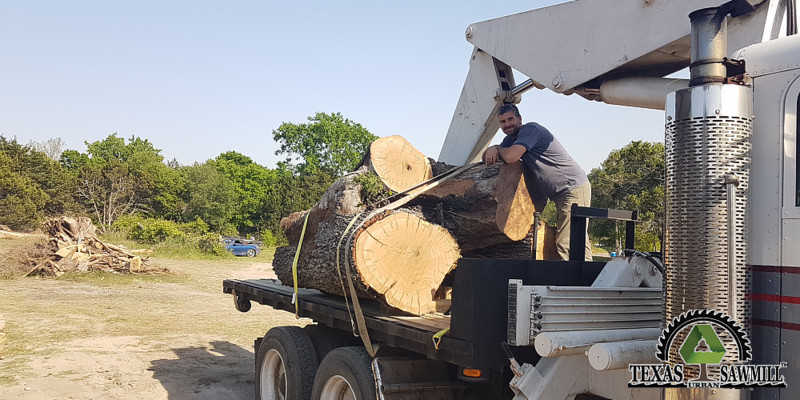 With the integration of our sawmill and tree re-purposing services, we can now focus more of our furniture efforts on native Texas Urban Wood Furniture. A bookmatched walnut table with bronze wishbone legs. Thanks for the visit & stay tuned for many more website additions! And remember, we are here to help Improve Lives & Save Trees!